Vanilla Orchid Thai Restaurant uses their own specialised couriers to deliver their food. Traditional peppery prawn crackers served with your choice of toasted chilli jam or satay sauce. Simple but effective. Marinated and char-grilled chicken skewers, served with our delicious homemade peanut satay sauce, salad and sesame seeds. Homemade spring rolls with glass noodles, mixed vegetables, carrot, cabbage and wood ear mushroom served with our own chilli sauce. Crispy and succulent ‘thrice cooked’ pork belly served with rocket, tomato and red onion, dressed with a fermented soybean, sesame, palm sugar and soy dressing. Crispy fish fillet fried in Thai spiced batter served with tamarind dipping sauce and sweet chill sauce. A traditional plate of pickled tea leaves, peanuts, fried lentils and beans, dried shrimp, sesame seeds, tomato, snake beans, lemon, garlic and chilli (Vegetarian option on request). Poached Tiger Prawns dressed in a kaffir lime, coconut milk, lime juice and chilli jam dressing with snake bean, red onion and cilantro. Medium-rare grilled tender Angus beef, thinly sliced and dressed with an aromatic Thai dressing of toasted chilli jam, lemongrass, kaffir lime leaf, lime juice, red onion and long chilli, finished with ground toasted rice. Tender roasted duck breast tossed in mint, coriander, spring onion, cucumber, cherry tomato, wombok, shallots and mixed lettuce with a lemon, galangal and kaffir lime dressing. Freshly minced chicken salad with mint, spring onion, cherry tomato, red onion and galangal and kaffir lime dressing. Served warm. Aromatic soup with tomato, mushroom, lemongrass, naam prik pao, baby corn, kaffir lime leaf and cilantro. Classic Thai soup with fragrant galangal and coconut milk, tomato, straw mushroom, baby corn, kaffir lime leaf and cilantro. Slow cooked in Asian master stock, aromatic and lightly spiced with cinnamon, kaffir lime, lemongrass, ginger, shitake mushroom and star anise served with a mint, basil and bean shoot salad. Marinated chicken in a crispy red curry batter with tamarind dipping sauce and sticky rice. Fried whole barramundi (or option of Barramundi fillets), crispy fried with a hot and sour sauce of chilli, garlic, tamarind, basil and palm sugar. Fried whole barramundi (or option of Barramundi fillets), with oyster sauce, garlic, coriander root and spring onion with succulent fried garlic. Stir fry with sweet Thai basil, green bean, mushroom, capsicum, onion and chilli. Stir fry with capsicum, broccoli, spring onion and cashew nuts in oyster sauce. Stir fry with fresh ginger strips, wood ear mushrooms, zucchini, spring onion, capsicum, carrot and special stir fry sauce. Stir fry with zucchini, tomato, baby corn, cauliflower, spring onion, carrot and capsicum in a Thai sweet and sour sauce. Stir fry with Thai Red curry paste, kaffir lime leaf, bamboo shoots, green bean, capsicum, Thai eggplant and Thai Basil. Stir fried mixed green leaves and green vegetables topped with satay sauce and sesame seeds. Fragrant green curry with coconut milk, palm sugar and kaffir lime leaf sauce with Thai eggplants, capsicum, bamboo shoots, carrot and Thai basil. Fragrant red curry with coconut milk, palm sugar and kaffir lime leaf sauce with Thai eggplants, capsicum, bamboo shoots, carrot and Thai basil. Fragrant Penang Curry with coconut milk, palm sugar and kaffir lime leaf sauce with green peas and snake beans. 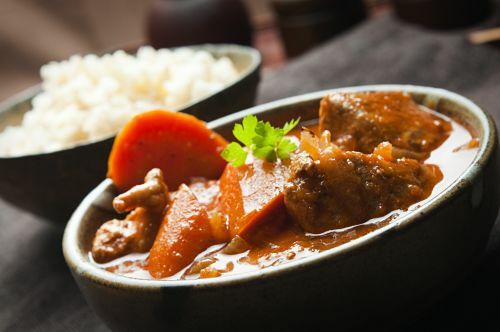 A Southern style curry with slow cooked chunks of prime lamb, potato, and pineapple in a creamy coconut milk and palm sugar sauce. Fresh roasted duck breast in a creamy red curry and coconut milk sauce with whole cherry tomatoes, lychees, snow peas and basil. A traditional Burmese curry of slow cooked Prime MSA oyster blade beef with ginger, garlic, spring onion and coriander. Rice noodles stir fried with egg, chives, bean shoots, carrot, cabbage and preserved daikon in a delicious tamarind stir-fry sauce. Flat rice noodles with egg, gai lan, bean shoots and special tamarind stir fry sauce. Stir fried glass noodle with sukiyaki chilli sauce, egg, Chinese cabbage, celery herb, red capsicum and shiitake mushroom. Stir fried fresh rice noodles with aromatic Thai basil, chilli, garlic oyster sauce and selected vegetables. Fried rice with chilli, garlic, basil and onion topped with a fried egg and crispy basil. Fried jasmine rice with snow peas, green peas, cabbage, carrot, onion, egg and Thai soy. Thai Jasmine rice cooked in coconut milk with kaffir lime and coconut meat. Fresh grilled roti served with our delicious homemade satay sauce. Fresh and crunchy corn fritters with red curry paste, snake bean, red onion coriander and basil served with Tom Yum mayonnaise. Mixed curried vegetables and potato in puff pastry served with yellow plum dipping sauce. Mixed vegetables in a thin crispy batter served with a tamarind dipping sauce. Tofu triangles in red curry battered with tamarind and palm sugar sauce. Fragrant soup with tofu, vegetables and nam prik pao. Creamy coconut milk soup with galangal, tofu and mixed vegetables. Rice noodles stir fried with vegetables, tofu, bean shoots, carrot cabbage and preserved daikon in a delicious tamarind stir-fry sauce with egg. Flat rice noodles with tofu gai lan, snow pea, mushroom broccoli, cauliflower special stir fry sauce and bean shoots with egg. Stir fried glass noodle with sukiyaki chilli sauce, egg, Chinese cabbage, celery herb, morning glory and shiitake mushroom. Mixed green leaves and green vegetables with tofu triangles and topped with satay sauce. Stir fried seasonal vegetables, tofu chunks with capsicum, broccoli, whole dried chilli, spring onions and cashew nuts in stir fry sauce. Tofu chunks, sweet Thai basil, green bean, mushroom, capsicum, spring onion and chilli. Fragrant green curry with coconut milk palm sugar kaffir lime leaf sauce with mixed vegetable, tofu, Thai eggplants bamboo shoot and Thai basil. Fragrant red curry with coconut milk palm sugar, kaffir lime leaf sauce with mixed vegetables, tofu, Thai eggplants bamboo shoot and Thai basil. Stir fried rice with selection of vegetables and tofu with egg.